Do you love original quotations that get to the nitty-gritty and, at the same time, can touch your heart and soul? 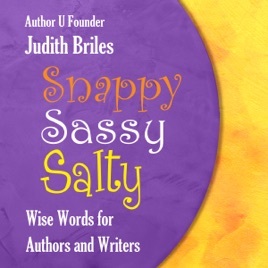 Author Judith Briles' favorite advice over the years to her many author clients is included: think and write snappy, sassy, and salty, and surround yourself with cheerleaders for your vision, not distractors. For the first time, she reveals publicly how a well-known author, columnist, humorist, and screenwriter had dinner with her, listened intently, then used her ideas in one of his columns - a column that he got paid for; she didn't. The cosmic goose had landed. Judith told herself that if she didn't start taking some of her own ideas and publishing them, others would. Her first book, The Woman's Guide to Financial Savvy, was published by St. Martin's Press a year later. She's on number 34 now.